Inside Prince Edward Island’s sleek new engineering school, students are putting their heads together to save the spuds. Members of at University of Prince Edward Island’s School of Sustainable Design Engineering’s first graduating class have come up with a brand new solution to an age old problem for the province’s primary industry – how to keep rocks out of potato bags. 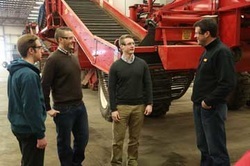 The University of Prince Edward Island’s School of Sustainable Design Engineering has given its third-year students a chance to gain real, hands-on industry experience at Allan Farm Equipment in Covehead, Prince Edward Island – a steel manufacturing facility that specializes potato harvesting equipment. What’s got him so jazzed is his third year project in this unique program model. It’s a real deal with a real PEI company where he and his team are helping solve a problem that has long plagued Island potato farmers. “You wouldn’t believe the amount of interest we had from farmers on this,” he said. Bennett says he is excited to get up and go to school every morning because he isn’t sitting in a classroom doing calculations, but heading to Covehead to put his book smarts into practice with an industry partner. The new Engineering school’s broad-based curriculum is hands-on. This year will see the first full graduating class. Last year, UPEI expanded its two-year engineering program to four, meaning students can complete their degrees in the province without leaving for other universities. The students have been divided into three groups and are helping fix design problems for PEI potato, lobster and blueberry industries. The provincial government committed $12 million for capital to the new School of Sustainable Design Engineering at UPEI with another $4 million for recruitment, operations, and start-up costs for a total of $16 million.